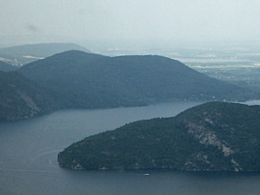 Lake George, high in the Adirondack Mountains, where there is rumored to exist a gateway to our future colonies in space. LAKE GEORGE, N.Y.: OCTOBER 23, 2017 — Since the discovery four years ago of the Tea Island Spatio-Temporal Fissure, scientists, prognosticators and development executives have struggled to part the curtain of silence that has descended upon this site in idyllic upstate New York. Speculation ran immediately to Lord Abercrombie, who is said to have buried a treasure there in 1758, a cover which must have been very useful to the men-in-black whose job it has been to contain news of the fissure thus far. More conscientious observers picked up on amorphous rumors of wormholes opening in the forest floor, and fretted about the stability of the space-time fabric in the southern Adirondack region. Nevertheless, despite the parade of labcoats making the round-trip by dinghy every day, the news has been suppressed quite successfully. An amazing feat, for it is momentous news indeed. We have now been authorized to reveal that we have made contact with our descendants from the future! Before we get too excited, it is important to note that our connection is somewhat tenuous. It seems that our counterparts from the future did not initiate contact on purpose. In fact, they seem not to be aware of us at all. The connections is strictly one-way. It is said to consist of a “bottomless” crack in the bedrock. Through this crack passes a handful of signals in the UHF band, and a slow drip of small cultural artifacts such as bath products, dinnerware and paper ephemera. The signals and the artifacts seem to originate from a member of the Hyades in the waning years of the 5th millenium AD, a period called "The Expansion Era," presumably referring to the expansion of the human species into outer space. We can of course confirm neither the source of the signals nor their meaning. They reach us only through the fissure, which we do not understand, and the only other signals available to us from the Hyades are not from the future, but from the past—from 150 years in the past! Everyone else will finally get a chance to judge for themselves. We are delighted to announce that several of the artifacts have now been cleared for release to the public! Stay tuned for Television from Outer Space, future history like you never will have already experienced beforehand!